The B.C. Supreme Court ruled in favour of the Kwantlen Student Association Wednesday morning, putting an end to a two-year dispute over the Canadian Federation of Students-B.C. Component’s refusal to accept Derek Robertson, the student associations’s representative, on its board of directors. Madame Justice Brown’s decision, stated that the CFS-BC board of directors was in violation of section 24 of the Society Act-BC and the CFS-BC’s own bylaws. The ruling set a precedent that bars societies in B.C. from applying provisions beyond those set in the Society Act-B.C. to determine qualification for appointment to a board of directors or membership of a society. Brown awarded the KSA with Robertson’s appointment to the board of directors and legal costs associated with the court petition. 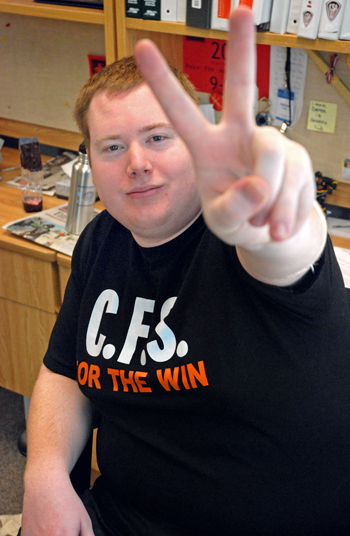 Robertson, director of external affairs for the KSA and ex-officio representative for the CFS-BC, held office on the board of directors for the CFS-BC previous to a conflict of interest in February 2008, when he resigned to campaign to have the KSA leave the CFS. Following a referendum, which reaffirmed Kwantlen students’ interest in remaining members of the CFS, Robertson’s nomination to rejoin the board of directors was not ratified by the CFS-BC. “He intended to do damage to society in all comments. The only check against that is the ratification process,” said Reid. Robertson considered the court battle, which included screenshots of his membership in anti-CFS Facebook groups, “a hail Mary.” The KSA focused on the law in the Society Act regarding requirements for being a director of a society, he said. The CFS-BC is honouring the ruling but will be “evaluating our legal options,” said Reid, hinting at the possibility of an appeal. “We accept that at this point Mr. Robertson is the director and we certainly expect that he will uphold his responsibilities, though I believe that he has shown inability to do that in the past,” he said. Robertson’s current term as director of external affairs and ex-officio representative for the CFS-BC will end on March 31, 2010.